Photo 1. The balance point of the foot is just behind the ball of the 2nd toe. Do you lose your stirrups? Stiffen your ankles? Have trouble getting your heels down? Does your stirrup swing forward when you ride? Do you carry your stirrup on your toes? Perhaps your difficulty results from the interpretation of riding with the stirrup on the ball of your foot. A small but significant change in foot placement could make all the difference to your ankle function and comfort when riding. 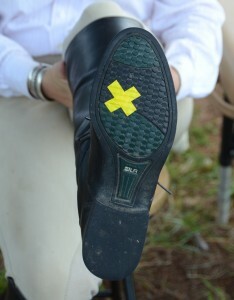 Next time you ride, notice where you place your foot on the stirrup. Are only your toes resting on the tread? Do you press down with the ball of your foot? Are you worried about getting caught in the stirrup and therefore have very little of your foot through? 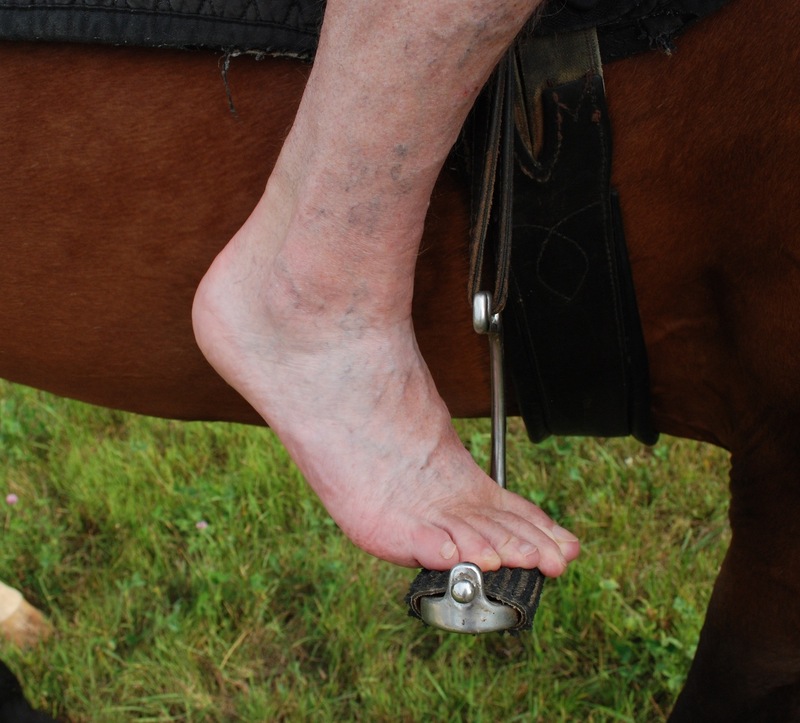 If so, consider getting safety stirrups so that you place your foot correctly on the tread for good ankle function. 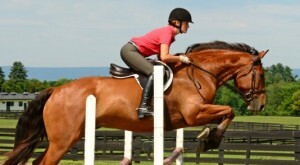 If your foot is not far enough through the stirrup you are on the ball of the foot instead of the balance point. 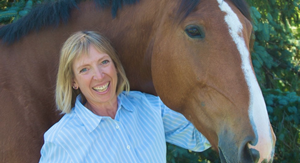 The correct position is with your foot resting with the “balance point of the foot” (George Morris) or “bubbling spring” (Sally Swift) on the stirrup. This location is just behind the ball of the 2nd toe. When riding with the balance point you will be able to lengthen your toes allowing them to rest flat inside your boot therefore, the boot crease will disappear. Photo 2. Pushing down with the ball causes the heel to rise. Have someone take a photo if you are not sure how you place your foot or look at an old pair of boots. They will have a deep crease across the toe box if you brace with the ball. This causes plantar flexion (pointing the foot downward), raises your heel and makes it impossible weight your heels correctly. Instead you will have to push the stirrup forward to have the appearance of a low heel but this causes many more problems! Locate the balance point of your foot by removing your shoes and socks. Take your fingers and find an indentation just after the arch and before the ball of the first and second toes. You want this area on the stirrup tread. Depending on the width, the tread may extend forward and/or back from the balance point as with polo other modern stirrups. 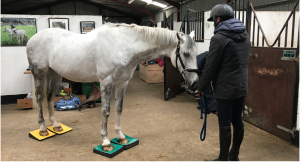 To feel why this is the correct location find something to stand on which simulates the stirrup. Place only the ball of your foot on it. You can use the ball for leverage to push down causing your heel to rise (similar to how women would walk in high heels). Place the balance point of your foot on the object. Notice that your ankle can sink down and that it is difficult it is to brace against the ledge. You still might pull your toes up but you don’t have the support to raise your heel as if to stand on the ball of your foot. You can weight your heel without pushing your lower leg forward and your ankle can sink down acting like a shock absorber when riding. Photo 3. Foot correctly positioned with the balance point on the stirrup tread. The toes are relaxed and long with the heel sinking below the line of the tread. Use this Murdoch Minute to locate the balance point of your foot. 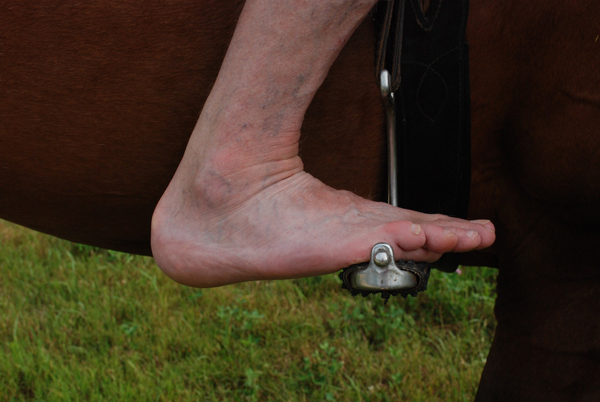 Experiment with riding with your foot stirrup tread when you ride. Change back and forth between your old and new place several times as feet are quite opinionated and take awhile to convince that something different might be better and always remember to enjoy the ride!